1986: tragedy struck at the Chernobyl nuclear reactor, Maradona led Argentina to victory at the football world cup with a little help from the hand of God and Jessica Ennis and Rafa Nadal arrived in the world. The Bangles Walked Like an Egyptian and Robert Palmer was Addicted to Love. In the cinema Ferris Bueller took a day off and Tom Cruise was Top Gun. Women had big hair and Dynasty shoulder pads while men sported the rolled-up jacket sleeves and loafers without socks look in an attempt to turn drizzly England into sizzling Miami. And sixteen year old Kevin Hicks disappeared from his South London home. Fast forward twenty seven years and Ukrainians are still suffering the effects from Chernobyl. Little Jessica grew up to be an Olympic gold medal winner, Tom Cruise is still disconcertingly wrinkle-free and Kevin remains missing. It’s because of youngsters like Kevin Hicks and the family and friends he left behind that the Miles for Missing People fundraising event is being held this year on International Missing Children’s Day. Dedicated athletes, novice joggers and fun runners will gather on Clapham Common on 25th May to tackle 10k or 3k races, a poster of missing loved ones pinned to each back. Rock Choir will be supporting the event for the fourth year by providing entertainment and motivation for the participants and many choir members will be fundraising and running too. We’ve sung at Wembley Arena and Wembley Stadium, recorded at Abbey Road Studios and broken more than one Guinness World Record but Miles for Missing People holds a special place in our hearts. Perhaps it’s the buzz when everyone joins in the fun with up-tempo numbers like Dancing in the Street or perhaps it’s spotting a tear in the eyes of a face in the crowd as we sing a ballad and knowing that the lyrics have a particular resonance for that person. Perhaps it’s staring at those missing person photographs and wondering why? and where? or listening to the heart-breaking stories of those who have been left behind. This year we’ll be singing our hearts out to our latest favourite song, True Colours. Recorded by Cyndi Lauper just a day after Kevin failed to return home in March 1986, the words still have a striking resonance today. So this year at Miles for Missing People I’ll be singing for every one of the 250,000 people who go missing each year. But above all when I sing, ‘If this world makes you crazy and you’ve taken all you can bear,’ I’ll be thinking of a kid from Croydon who never came home. By Siân Rowland of Rock Choir, the UK's biggest contemporary choir. 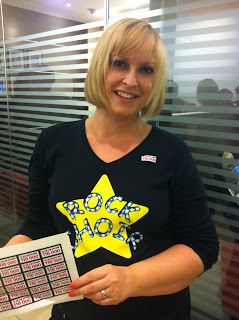 Siân has attended every Miles for Missing People event so far! Sad. Hope the event goes well, and you have fun with the choir.